Posted in A WORLD OF DIFFERENCE Institute, Anti-Bias, Education. 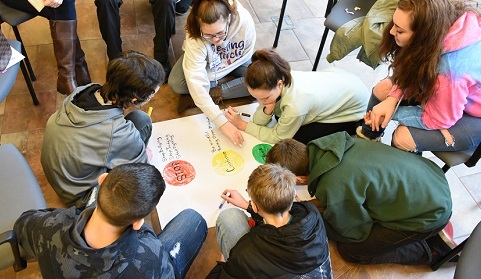 On January 12th, 2018 schools in the Greater Capital District of Upstate New York attended the 14th annual Students Together Opposing Prejudice (STOP) conference; hosted by Siena College and facilitated by the Anti-Defamation League. All together 240 students and 40 Educators from 30 schools were in attendance. 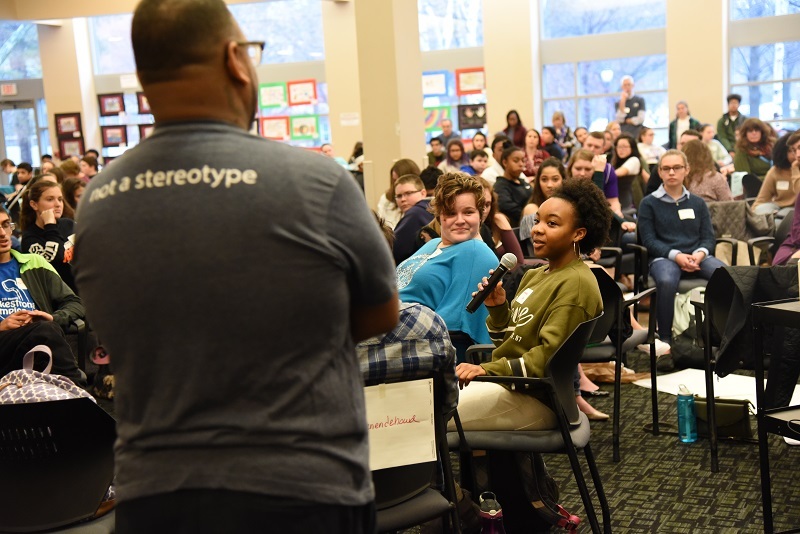 The STOP conference is held in remembrance of Dr. Martin Luther King, Jr. and provides a platform for students to engage in discussions about bias, stereotypes and social justice as well as grow their skills as leaders in their schools. In the morning the participants attended small breakout sessions where they were mixed with students from other schools. In these sessions they had the opportunity to participate in activities and discussions about bias, prejudice and stereotypes and to learn from one another. In the afternoon, the action planning goal for the conference was to think of ways to fight bias in their schools. The audience viewed a short video entitled “Peanut Butter and Jelly Racism” created by the New York Times, in which the viewers are educated about what implicit and explicit bias are. After viewing the video, participants engaged in dialogue with peers from their school to think about ways they can fight bias back in their school community. The conference participants then shared ideas to create more inclusive school environments such as: starting social programs or joining ADL’s No Place for Hate program; starting mentoring programs for their elementary schools; and bringing in guest speakers to educate on a variety of topics. At the end of the conference the students were encouraged to make personal commitments to creating change and to post them on social media to demonstrate their dedication. One powerful quote which encapsulated the goal of the day read “We need to be remodels to young people and truly believe that we can create change”.